To help you find the Best Acid Reflux Relief, TopConsumerReviews.com provides you with an in-depth comparison of Nexium and Acid Free Flux. 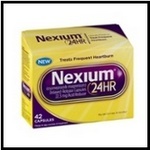 Nexium 24HR offers round-the-clock relief of Acid Reflux symptoms. Available in capsule, tablet, and ClearMinis formats, this product is one of several on the market that uses active ingredients like esomeprazole that work as proton pump inhibitors: reducing the amount of acid that flows from the stomach to the esophagus by shutting off the pumps in the GI tract that produce that acid. Nexium comes packaged as three separate 14-day applications. In other words, you take the medication every day for two weeks, giving Nexium time to take effect. You repeat the 14-day course only if necessary. Because of this approach to dealing with Acid Reflux, relief isn't instantaneous and you may need an over-the-counter chewable antacid or other remedy for the first 24 hours. However, users say that there's nothing that compares to Nexium for long-lasting relief of heartburn - exactly because it deals with the source and doesn't just temporarily mask the symptoms. In fact, according to the manufacturer, Nexium is not only the #1 selling product for fighting heartburn and acid reflux, but it is also the one that is most frequently used by pharmacists and doctors when diagnosing themselves. It's important to note that this product is recommended for adults 18 years of age and older. Users of Nexium rave about how easy it is to swallow just one "little purple pill" with a glass of water before eating in the morning, and hundreds of reviews describe how Nexium worked for combatting Acid Reflux when no other product was able to offer relief. Plus, Nexium is extremely affordable: less than $25 for three 14-day courses. For all of these reasons, Nexium is the product of choice when it comes to safe, proven, and budget-friendly long-term relief for Acid Reflux. It earns our highest rating. Offered by Native Remedies, an "A+" rated company with the Better Business Bureau, Acid Free-Flux is one of two products they sell that are designed to alleviate symptoms of Acid Reflux. Each remedy is formulated with different ingredients, so be sure to check out our reviews on each one to decide which one is better for your needs. Acid Free-Flux is safe for all ages and is taken by mixing ½ mL in ¼ cup of water and sipping slowly. This can be repeated every 20-30 minutes until symptoms subside. It is recommended that you use this product 10 minutes after a meal, or 30 minutes after brushing your teeth. According to Native Remedies, overall improvement can be felt within a few days, but it may take longer to see the full effects of Acid Free-Flux. Each 60 mL bottle is expected to last about 120 days, which makes the regular price of $39.95 very affordable. Many of the products sold by Native Remedies have an everyday offer of buy two, get one free, and Acid Free-Flux is eligible for this promotion. If you'd like to save a little money, watch for pop-ups and other offers. At the time of our most recent visit to the Native Remedies site, we saw a pop-up promotion of 15% off and free shipping if we signed up for their email list, along with an offer at the top of the site showing 20% off and free expedited shipping on orders over $100. You can also opt in to their Auto Delivery service, which comes with additional savings of 10% and can be scheduled every 2, 4, 6, or 8 weeks. While there aren't thousands of customer reviews on Acid Free-Flux, the ones we found were overwhelmingly positive. A big advantage of using this product is that it can be taken by people of all ages, as needed: there's no need to follow a 14-day course or any other rigid protocol - though, of course, as with most products, taking them regularly can help you figure out if it's working for you. And, Native Remedies wants you to try Acid Free-Flux for at least 30 days before deciding; their excellent satisfaction guarantee gives you a full year to request a refund if you don't think Acid Free-Flux provided enough relief of your reflux symptoms. Because of its homeopathic formula, suitability for patients of all ages, and ironclad money-back guarantee, Acid Free-Flux is an affordable, effective option for people who want an all-natural product for alleviating their Acid Reflux.